More Fun Facts About Radio Frequency Identification! Not only do RFID devices come in the form of small chips that can be embedded into cards, they also come as microchips that can be implanted into animals and Alzheimer’s patients. A few weeks ago, we blogged about the benefits of using radio frequency identification devices to create more secure entrance to your facilities. But did you know there are other ways to use RFID devices? Today, we’re going to go in-depth into that many ways that you can use RFID devices. An RFID device is a small, flexible electronic device that can carry data and even be rewritten. These small devices are great for attaching to products. Producers use RFID devices to track their products from the time it’s made to the time it’s purchased. Companies worldwide also use RFID devices to track packages to make sure they are en route to arrive on time. Some people even estimate that the information gathered from tracking consumer products will someday be used to anticipate consumers’ preferences and buying habits. Talk about futuristic technology! RFID devices were originally used to track cattle. Today, a very small form of the RFID device is injected into animals to track them should they ever run away or get stolen. 3 million cats and dogs are euthanized in shelters around the United States every year. With tracking from microchips, this number is dropping. A RFID microchip is about the size of a grain of rice and is painlessly inserted into the fatty skin of a pet’s neck. These small devices help to reunite pet owners with their lost pets and save lives. Our previous radio frequency identification blog explained how an RFID device helps to control access to secure facilities by inserting the device into an easily-scanned card. RFID devices also work on a more personal level to track people as well. Many people are turning to RFID devices to secure Alzheimer’s patients. This device works similarly to a pet microchip. 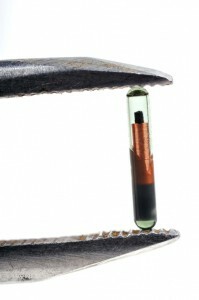 The tiny microchip carries vital medical information and is inserted into the patient’s arm. Should the patient become lost and disoriented, an easy scan reveals their address and any emergency medication or treatments they may need access to in the event of an emergency. This is a great way for many people to keep their parents safe. This entry was posted on Monday, February 8th, 2016	at 5:00 pm	. You can follow any responses to this entry through the RSS 2.0 feed. Both comments and pings are currently closed.